This article is about the British decimal coin. For the British soap actress, see Jill Halfpenny. 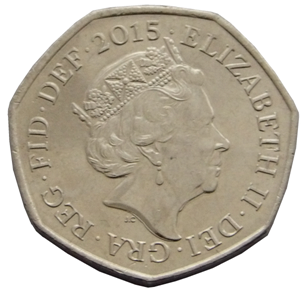 For the pre-decimal halfpenny coin, see Halfpenny (British pre-decimal coin). 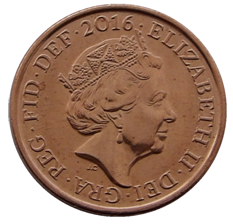 The British decimal halfpenny (​1⁄2p) coin was introduced in February 1971, at the time of decimalisation, and was worth one two-hundredth of a pound sterling. It was ignored in banking transactions, which were carried out in units of 1p. The decimal halfpenny had the same value as 1.2 pre-decimal pence, and was introduced to enable the prices of some low-value items to be more accurately translated to the new decimal currency. The possibility of setting prices including an odd half penny also made it more practical to retain the pre-decimal sixpence in circulation (with a value of ​2 1⁄2 new pence) alongside the new decimal coinage. 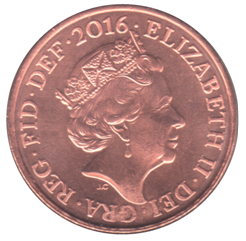 The halfpenny coin's obverse featured the profile of Queen Elizabeth II; the reverse featured an image of St Edward's Crown. It was minted in bronze (like the 1p and 2p coins). It was the smallest decimal coin in both size and value. The size was in proportion to the 1p and 2p coins. It soon became Britain's least favourite coin. The Treasury had continued to argue that the halfpenny was important in the fight against inflation (preventing prices from being rounded up). The coin was demonetised and withdrawn from circulation in December 1984. The reverse of the coin, designed by Christopher Ironside, was a representation of St Edward's Crown, with the numeral "1/2" below the crown, and either NEW PENNY (1971–1981) or HALF PENNY (1982–1984) above the crown. Only one design of obverse was used on the halfpenny coin. The inscription around the portrait on the obverse was ELIZABETH II D.G.REG.F.D. 19xx, where 19xx was the year of minting. Both sides of the coin are encircled by dots, a common feature on coins, known as beading. As on all decimal coins produced before 1984, the portrait of Queen Elizabeth II by Arnold Machin appeared on the obverse; in this portrait the Queen wears the 'Girls of Great Britain and Ireland' Tiara. A decimal quarter-penny coin (to be struck in aluminium) was also proposed (which would have allowed the pre-decimal threepence to continue to circulate with a value of ​1 1⁄4 new pence), but was never produced. ^ Clayton, Tony. 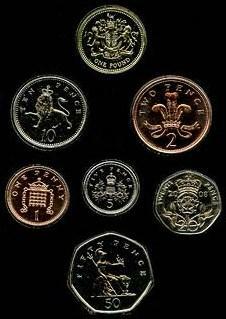 "Decimal Coins of the UK - Halfpenny". Retrieved 2006-05-24. ^ "1p Coin". British Royal Mint. Archived from the original on 2006-04-27. Retrieved 2006-05-23. ^ Michael, Michael (2013). Standard Catalog of World Coins - 1901-2000. Krause Publications. p. 990. ISBN 1440229627. ^ Tony Clayton. "The Change to Decimal Coinage". Archived from the original on 2008-03-29. Retrieved 2008-04-13.